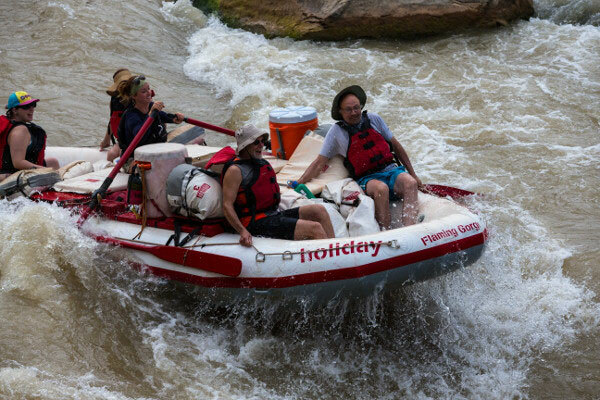 This Desolation Canyon river rafting trip, as its name implies, floats you through some of the most remote areas left in the continental United States. 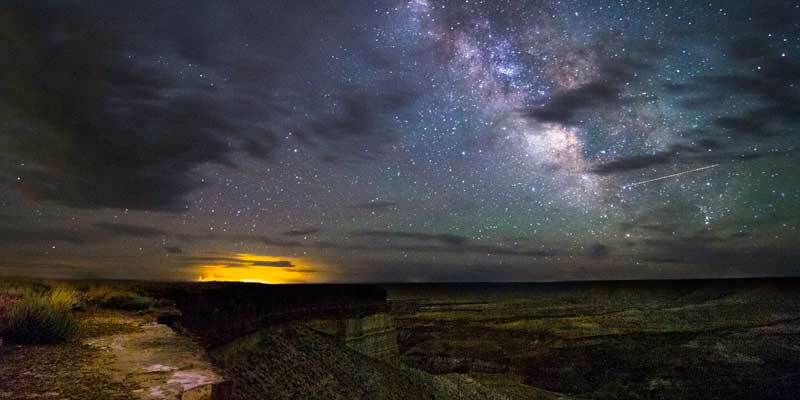 The Tavaputs Plateau, through which the Green River cuts Desolation and Gray canyons, boasts one of the largest roadless areas in the American west, making the region a priceless preserve of quality dark skies. Spend your days exploring outlaw hideouts, ancient indigenous cultural sites, splashing through consistent, fun whitewater, and in the evenings let your mind expand alongside the universe around us. 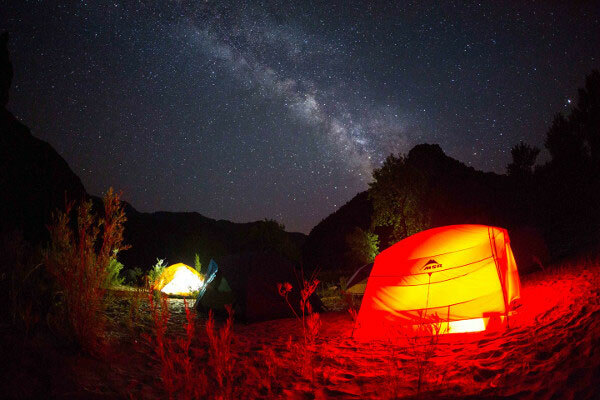 Using both binoculars and the naked eye, this trip will explore the Milky Way, look for the Andromeda Galaxy, watch satellites and meteors, and hear stories about the constellations. You'll soar over the Sand Wash put-in and land on the top of the Tavaputs Plateau in a small airplane, then float southwest for 84 miles and over 60 rapids! The canyon scenery changes dramatically from day one to the end of the trip, from gold to red to bronze to gray, until the walls finally drop away just beyond Swasey's Beach and take-out, just north of our Green River headquarters. 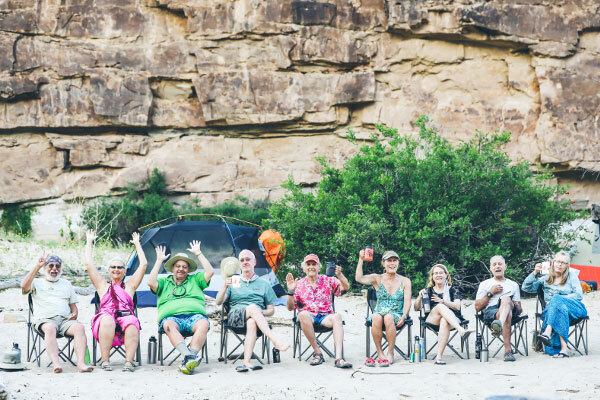 Desolation Canyon trips are true wilderness adventures, and trip itineraries vary widely depending on weather, the desires of each group, campsite availability, and the need to be courteous to other groups on the river. This is a sample itinerary intended to provide one example of a five-day trip through Desolation and Gray canyons. In late summer, we lengthen the Desolation Canyon trip by one day to account for lower river flows. Plan to arrive in Green River, Utah, one day before your trip in order to attend a pre-trip meeting at 8:00 p.m. (Mountain Time). We'll go through a brief orientation to prepare you for life on the river, give you your waterproof bags, answer any last questions, and let you know what time to meet for your flight the next morning. Our store will be open if you need to purchase last minute items (please look at our packing checklist for a list of items you can find at our store). Special note: due to the limited space and weight limits on the aircraft, please plan to bring any specialty sodas, beer, wine, or other extra heavy or bulky items to our headquarters by 2:00 p.m. the day before your trip. Day 1: Please arrive promptly at the predetermined time established at last night's pre-trip meeting. We'll drive you out to the local airstrip to meet your pilots and prepare for your flight to the boat ramp. It's approximately 30 minutes from Green River to Sand Wash, along the same route you'll be floating for the next several days. Your guides will be waiting to meet you at the landing strip, and will lead you on a gorgeous 45-min downhill hike to the river bottom. Be sure to wear appropriate shoes for the hike. Guests who are unable to hike can ride to the boat ramp in one of our vans. 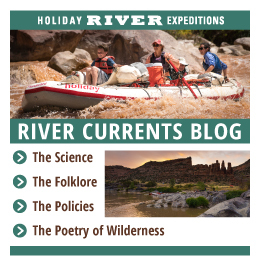 We'll push off into the lazy currents of upper Desolation; imagine you are one of John Wesley Powell's boatmen, seeing this region for the first time, with no idea what to expect around each new corner. We'll settle in to camp that night and treasure the rare experience of watching darkness fall in the absence of light pollution. Day 2: Wake to the sounds of canyon wrens and your guides calling you to coffee and breakfast. Take advantage of the morning calm to paddle an inflatable kayak. We'll run our first rapids today as we drop deeper into the canyon. Check out a cultural site and wonder at the story told by the images carved in stone. At night, listen to star stories and learn how to find the rising summer constellations such as Cygnus and Lyra. Day 3: Today we'll pass through the deepest part of Desolation Canyon: over 5,000 feet from river to rim! Enjoy a tour of the historic Rock Creek Ranch, where Butch Cassidy's Wild Bunch rested their horses and bootleggers traded moonshine for apricots. End your day with the wildest rapid in the canyon, Cow Swim. Created by a flash flood in 2008, Cow Swim is an exciting reminder that geology is happening continuously. Day 4: We'll pass out of Desolation Canyon today and into Gray, a dramatic transition made even more exciting by Wire Fence and Three Fords rapids. 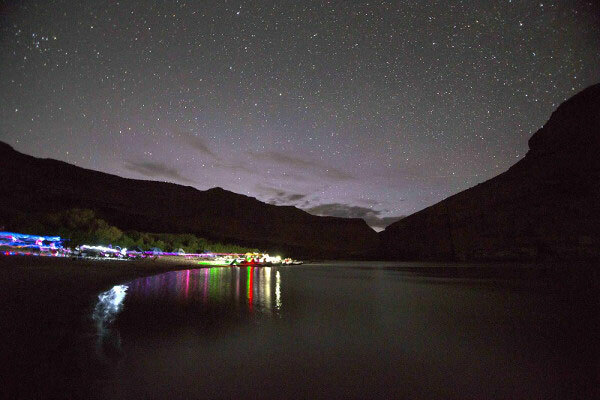 Hike along a side canyon and examine mineral deposits seeping out of the canyon walls, or lounge on the beach before one last gourmet dinner and dark, starry night on the river. Day 5: We will run a half dozen more rapids before lunch and then take out at the end of the canyon, near Swasey's Beach. We'll load boats onto trailers and take you for one last ride, 20 minutes down the road to our headquarters in Green River, for an anticipated return time of 3:00 to 4:00 p.m.
Our itinerary for a 6-day Desolation Canyon rafting trip is similar, although with lower river flows and one extra day to explore, you can anticipate seeing different campsites and possibly different side trips than you might on the 5-day trip. Wilderness river trips are changeable by nature. Please understand that this is only a sample itinerary, intended to give an idea of how your time will be spent on the river. You may have the opportunity to do all of the above activities, or you may have a variety of other memorable and exciting experiences. Holiday's motto is "Go With the Flow", and we encourage you to arrive with an open mind, a flexible attitude, and an appetite for adventure! We had the best time in Desolation Canyon! The guides were wonderful - very friendly and knowledgeable. The campsites were always nice, well thought out location for the kitchen, bano and camp sites. Riding the rapids in the inflatable kayaks was a blast. We will definitely travel with Holiday again! Our guides, Sam, Nick and Larkin were excellent. They worked together seamlessly setting up camp, making the meals, and providing all kinds of information while on the river. The evening stargazing with Scott was very educational. This is my second Holiday trip and both were exceptional. I really enjoy how there were many ways to have fun on the river-duckies, floating in life vests, hiking, swimming as well as sightseeing on the oar boats. Your guides were easy to get to know and encouraging in activities. Their love of the river, especially from Susan was evident. I also loved getting to know more about dark skies from Jesse.